On the left is, Cacsmy Brutus, a.k.a. Mama Cax - a Haitian-American Blogger, Advocate, Motivational Speaker and Model represented by JAG Models. She is stretching and wearing orange active wear by ASOS. In the middle the How Do I and National Inclusion Week logo are featured, which lets you know which date the campaign starts (24-30 September). On the right is Chloe Ball-Hopkins, who is a GB Paralympic Athlete and freelance journalist. She is modelling ASOS’s tie-dye waterproof jumpsuit. Summary: National Inclusion Week is an annual opportunity to raise awareness of Inclusion and Diversity in the workplace by Inclusive Employers. This year we want to spotlight businesses that have made accessibility and disability inclusion a priority, which we hope will encourage other organisations to embed inclusion in their policies and strategies because when the workplace is accessible – everyone wins! ASOS worked in partnership with the British Paralympics Association and Paralympian athletes to design ceremony and formal wear for the PyeongChang 2018 Winter Paralympics GB team. This builds on their work with Paralympics GB for the Rio 2016 Summer Paralympic Games. In July Asos were praised for selling clothes designed with people who have disabilities in mind. The online retailer has released a tie-dye waterproof jumpsuit for festival season, which has been adapted to be wheelchair friendly. It was designed in collaboration with GB Paralympic hopeful Chloe Ball-Hopkins, who also modelled it for the site. Chloe says she wants to make "fashion that is accessible to everybody". Pictured: Chloe and her friend smile into the camera as they model their jumpsuits. · With ASOS being such a leader within the fashion industry - Their inclusive nature could lead to models with disabilities becoming much more common, which will help fill the disability employment gap and improve the UK economy. · More models with disabilities means the fashion industry can benefit from the Purple Pound – the spending power of people with disabilities and their families is £249bn, and they are more likely to spend it with organisations that employ people with disabilities. · It’s not tokenistic - It's not the first time Asos has included a model who has a disability in a campaign. Back in January it featured Mama Cax, a model who had her leg amputated, in one of its activewear campaigns. Mama Cax was also featured in TeenVogue’s September issue. 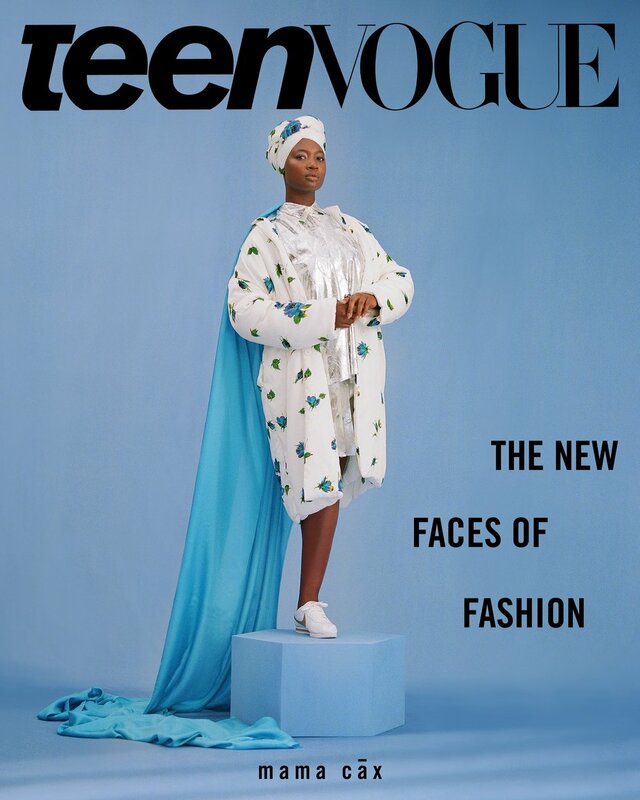 In the cover she is wearing a white turban, a white floral jacket and has a large blue cape flowing behind her while she stands on a blue box. Behind her the caption reads: “The New Faces of Fashion” - referring to the other models with disabilities that the magazine has featured in their September issue.